A radio spot released in 1967 advertises Disneyland's "rollicking adventure" with "bloodthirsty cut-throats..." in the form of the brand new Pirates of the Caribbean attraction. 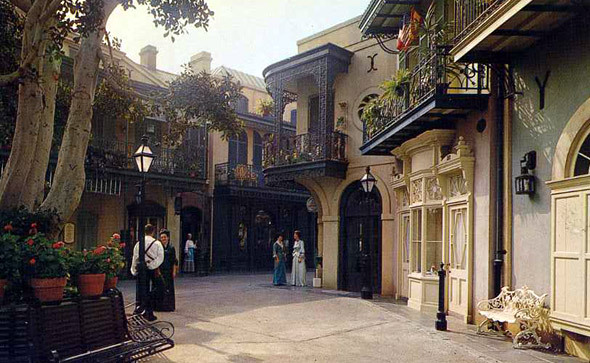 Disneyland's Pirates of the Caribbean attraction is the centerpiece of the "New Orleans Square" section of the park, an amazingly faithful reproduction of a French Quarter boulevard from a century ago. Lacy iron grillwork on the balconies and shadowy corridors complete the illusion as guests stroll through lazy Louisiana. 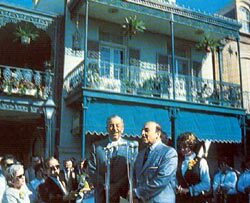 In this photo, Walt Disney officially opens New Orleans Square in July of 1966 with Victor Schiro, the actual mayor of New Orleans at the time. The new section of the park occupied three acres and cost $18 million. A reporter from New Orleans that was covering the event was rumored to remark that the area "is the next best thing to being there!" The new Square sat adjacent to the vacant plantation manor that would someday become the Haunted Mansion, another feature of the New Orleans Square area of Disneyland. The attraction posters promise that a trip through the Pirates of the Caribbean will allow guests to "set sail with the wildest crew that ever sacked the Spanish Main!" 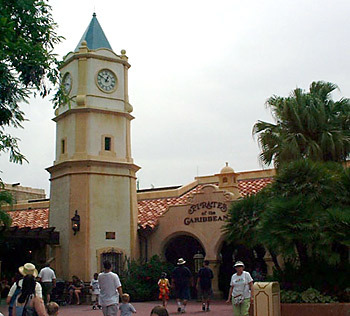 It should be noted that the Pirates attraction at Walt Disney World is in a section of the Magic Kingdom called "Caribbean Plaza" (pictured, right), which was created and themed specifically to the ride, and offers a more authentic "Caribbean" flavor. But both parks immerse guests into an environment that blends almost seamlessly with the POTC experience. When guests enter the queue area to wait for their boat to transport them through the attraction, they find themselves deep inside a land of perpetual twilight. A parrot "barker" sits outside the queue to Walt Disney World's Pirates, beckoning guests to enter the attraction. In this evening bayou, lazy fireflies are starting their evening flights and a local swamp-dweller passes the evening plucking out familiar southern tunes on his old banjo. 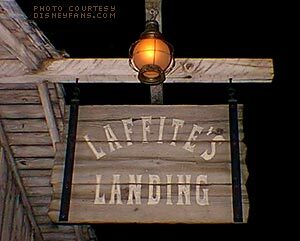 Guests wander past a cleverly concealed restaurant (called the Blue Bayou, one of Disneyland's finest and most popular dining areas), and line up to catch their boat at Laffite's Landing. A dinner at the Blue Bayou is a Disneyland experience not to be missed. After entering your boat, it drifts off placidly through the misty waters, past a lolling houseboat under an amazingly realistic moonlit night. Crickets, frogs, toads, 'gators and all sorts of waterfowl (hidden behind the mangroves) sing their eerie songs quietly throughout the swamp as you drift slowly toward the stone walls of a canal, which narrows into a brick channel that sweeps the small flat-bottom boat quickly toward a dark corridor. From somewhere ahead, a steady low voice seems to be warning you of the adventures that may lie ahead... But for now, the gentle evening holds sway. 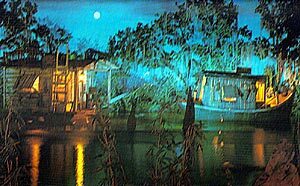 The Blue Bayou is widely regarded as Disneyland's most effective "outside-inside" effect. Situated inside of a 4-story high set, the flickering lighting of lamps and lanterns reflecting off of the gently-lapping waters creates a convincing outdoors experience. This is amplified by a queue design that gradually winds away from the natural sunlight, taking the guests through a simulated onset of the evening hours. "Psst! Avast there! It be too late to alter course, mateys... and there be plundering pirates lurking in every cove, waitin' to board. Sit closer together, and keep your ruddy hands inboard. That be the best way to repel boarders. And mark well me words, mateys... dead men tell no tales! Ye come seekin' adventure and salty ol' pirates, aye? Sure ye come to the proper place. But keep a weather eye open, mates, and hold on tight, with both hands if you please... there be squalls ahead, and Davey Jones waiting for them what don't obey..."
After turning a final corner in the brick channel, guests find the owner of the mysterious voice: a living "Jolly Roger!" 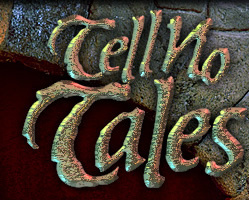 Mounted on the bricks above the boat's path, a plaque mounted with crossed swords and a talking skull (voiced by Disney legend "X" Atencio) asks the guests to take heed of his warnings. Atencio not only provides the voice, but he also was responsible for writing the entire show script. X Atencio narrates the introduction to the dead men's grotto, in the form of a talking Jolly Roger.